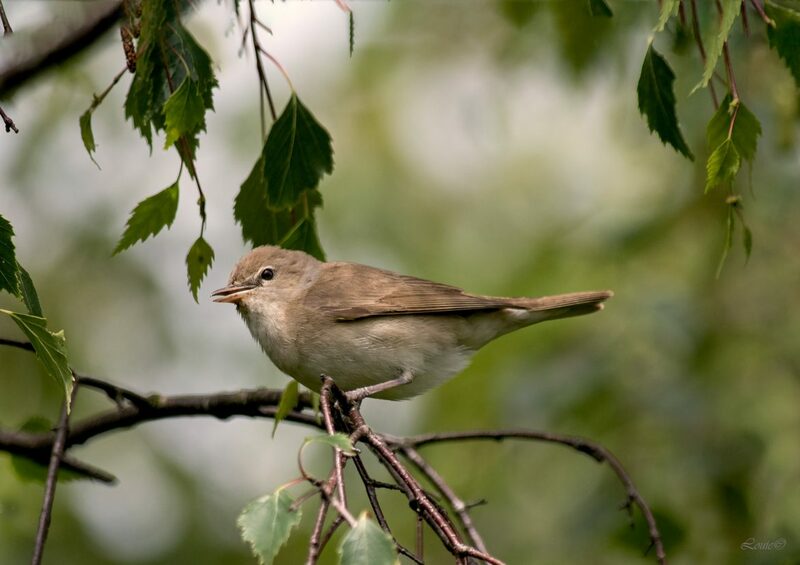 The Garden Warbler is a common and widespread small bird that breeds in most of Europe and in western Asia. It is a plain, long-winged and long-tailed typical warbler with brown upperparts and dull white underparts; the sexes are similar and juveniles resemble the adults. Its two subspecies differ only slightly and interbreed where their ranges overlap. Due to its lack of distinguishing features, this species can be confused with a number of other unstreaked warblers. 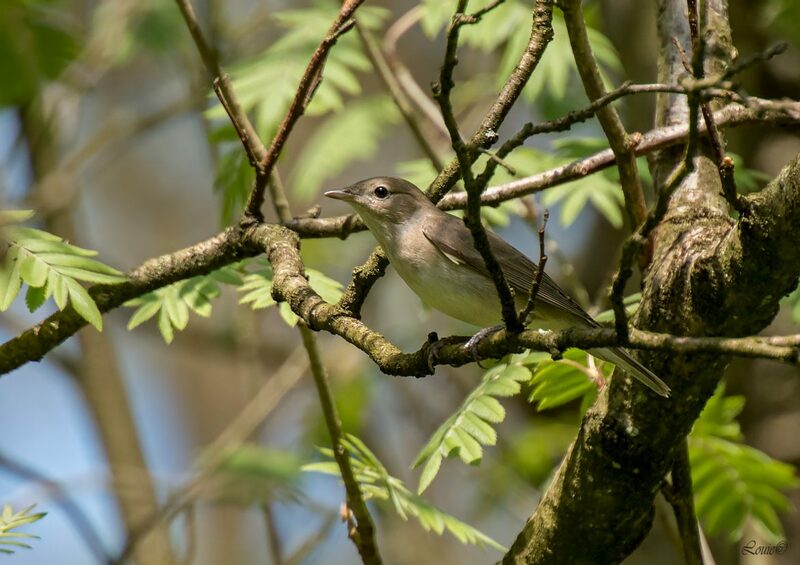 The garden warbler's rich melodic song is similar to that of the blackcap, its closest relative, which competes with it for territory when nesting in the same woodland. The preferred breeding habitat in Eurasia is open woodland with dense low cover for nesting; despite its name, gardens are rarely occupied by this small passerine bird. The clutch of four or five blotched cream or white eggs is laid in a robust cup-shaped nest built near the ground and concealed by dense vegetation. The eggs are incubated for 11–12 days. The chicks are altricial, hatching naked and with closed eyes, and are fed by both parents. They fledge about 10 days after hatching. Only about a quarter of young birds survive their first year. The garden warbler is strongly migratory, wintering in sub-Saharan Africa. A wide range of habitats are used in Africa, but closed forest and treeless Sahel are both shunned. Insects are the main food in the breeding season, although fruit predominates when birds are fattening prior to migration, figs being a particular favourite where available. These warblers have a mixed diet of insects and fruit in their African wintering grounds. The garden warbler is 14 cm (5.5 in) long with a 7.6–8.4 cm (3.0–3.3 in) wing length. The weight is typically 16–22 g (0.56–0.78 oz), but can be up to 35.5 g (1.25 oz) for birds preparing to migrate. It is a plain, long-winged and long-tailed bird with unstreaked olive-brown upperparts and dull white underparts. It has a whitish eyering and a faint pale supercilium, and there is a buff wash to the throat and flanks. The eye is black, the legs are bluish-grey and the strong bill has a grey upper and paler grey lower mandible. The male and female are indistinguishable by external appearance including size. Juveniles have a looser plumage than an adult, with paler and greyer upperparts and a buff tone to the underparts. The eastern subspecies S. b. woodwardi is slightly larger and paler than the nominate form with a greyer tone to the upperparts and whiter underparts. The subspecies are hard to distinguish visually where they occur together in Africa, but a wing length greater than 80 mm (3.1 in) confirms S. b. woodwardi when birds are trapped. 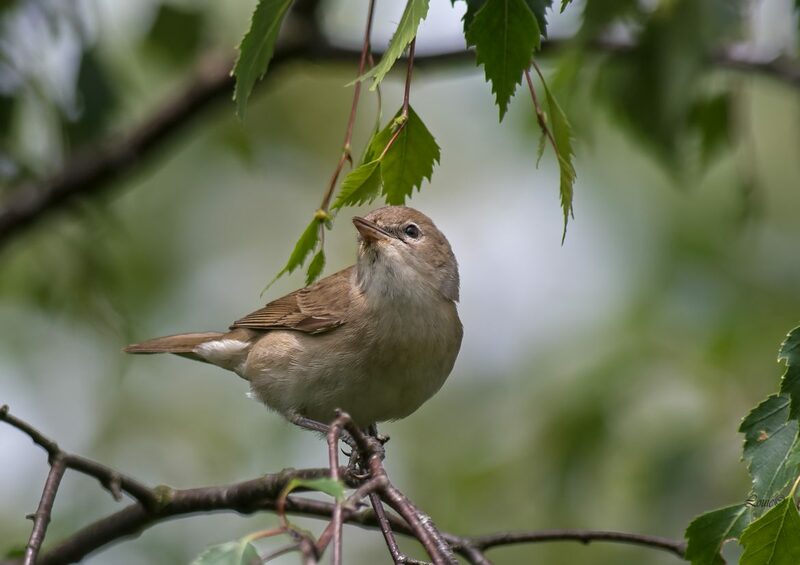 The plain appearance of the garden warbler means that it can be confused with several other species. The melodious and icterine warblers usually have long bills and a yellowish tint to their plumage. 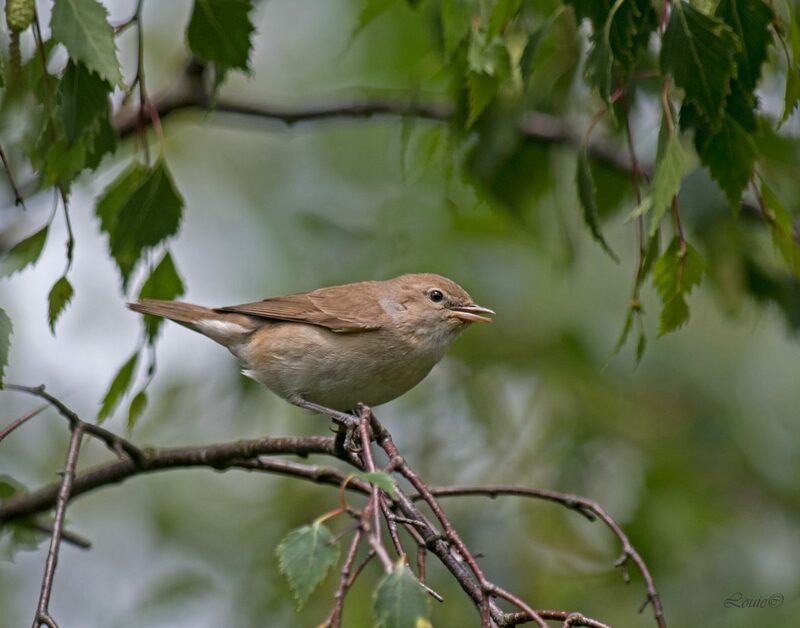 The booted warbler is similar in colour, although it is smaller, more delicately built and has a flesh-coloured bill. Western and eastern olivaceous warblers are also relatively small, and have white outer tail feathers as well as a pinkish bill. Juvenile barred warblers, which lack the obvious barring of adults, are much larger than garden warblers and have a pale double wingbar. Juvenile garden warblers have a partial moult mainly involving the body plumage between June and September prior to migration. Adults also have a similar, but sometimes more extensive, partial moult in late summer, and a complete moult in their African wintering areas before the return migration.